Select from a ‘Back-up Mode’ or ‘Real-time Sync Mode’. ■ Back-up Mode: Export phone contacts or import contacts you have made a back-up, when needed. 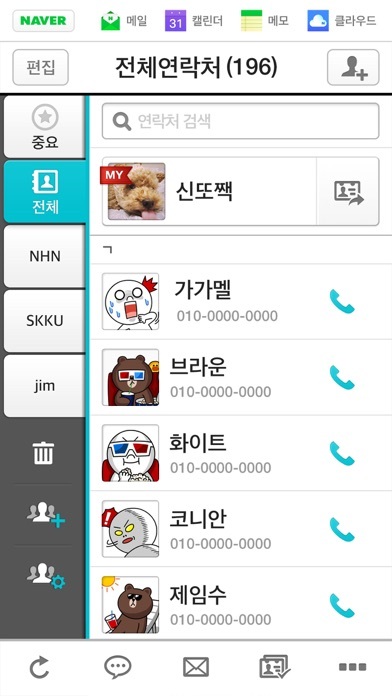 ■ Sync Mode: Connect your mobile phone contacts and your Naver contact list ONCE, and any changes made to your contacts will be applied automatically. Useful functions, including ‘Group Management’/’Redundant Contact Organization’ is also provided in the Sync Mode. [Description] A Real-time Sync Mode is offered along-side the Back-up Mode. 1. Select a contact storage method. 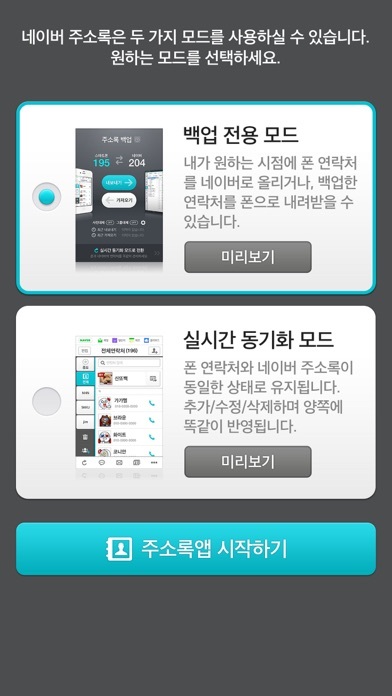 ■ ‘Sync Mode’ that automatically stores and manages contacts. ■ ‘Back-up Mode’ that makes manual import and export possible. 2. Easily manage your smart phone contact list. ■ ‘Redundant Contact Organization’ function that helps find contacts, including phone numbers and emails. ■ Function that deletes or hides contacts that has no name or phone number. 3. Try out the easy-to-use Group Management and Group Call function. 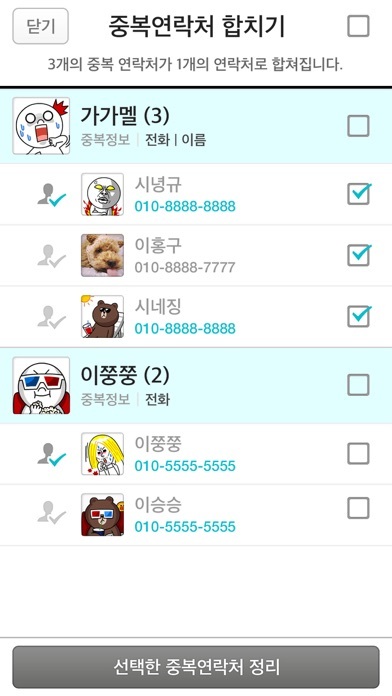 ■ Easily add and move groups from the contacts list. ■ Send group emails or group SMS with a single touch. 4. Safely protect contacts when your phone is lost by using the PC (Supported only with the Sync Mode) ■ Delete/restore contacts using the ‘PC web phone loss response’ menu if you have misplaced your smartphone. ■ Trash can and restoration function allows you to restore your contacts any time, even when you’ve erased it by mistake. I am using iPhone6+. I've not sent my contacts from my phone to the naver and vice versa. Definitely this naver contact application is positioned as the monopoly to transit your old contact list to another device in wifi sync. Yes, this is good! 어느날 갑자기 아이폰 전화목록이 초기화되는 초유의 사태 발생! 이전에 백업했건 앱으로 복원을 하려는데 서비스 종료라니 ㅜㅠ 다행히 네이버 주소록 앱을 이용해서 엑셀로 있던 주소록을 정리~ 그리고 내려받기~ 이제 주소록 걱정은 많이 덜었네요! 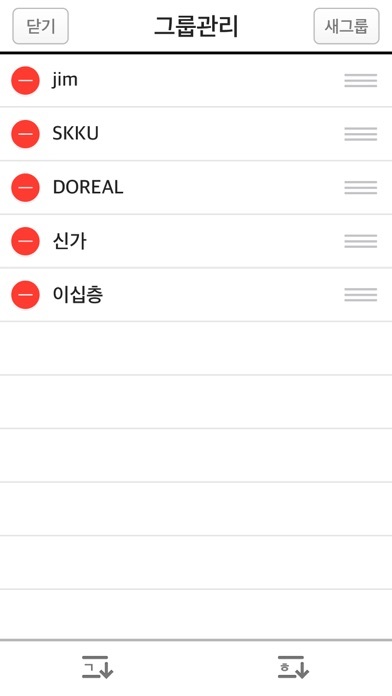 우리나라 유저특성을 고려한 ui 같아서 사용성이 좋은것 같습니다. 단말기 여러개 사용할때 완전 좋네요!